The vast majority of women will be a victim of hormonal-related breast discomfort at some point in their lives. For many women this discomfort is far more than a mere inconvenience. Topically applied Advanced Breast Therapy Cream (US Pat. 6,631,806) was designed for ameliorating discomfort due to cyclic mastaglia as well as other hormonally-associated breast conditions (ex: pre/post menopausal pain & swelling). Safe, effective, easy to use. In an in-house study, over 80% of women with menstrual-related discomfort/tenderness (including women with fibrocystic breasts) had 100% alleviation of discomfort while the rest had at least 75% improvement. What causes hormonal breast discomfort? Cyclic Mastaglia, which is most often seen in women in their 20-30s as well as perimenopausal women in their 40s, is caused by fluctuations of hormonal levels during the course of the menstraul cycle. Some studies credit the changing ratio of progesterone to estrogen and others point to differentials in the levels of prolactin. The body’s natural cyclic hormonal changes can be influenced by severe levels of emotional or physical stress (as an example of the latter, many endurance athletes may experience altered menstration patterns). Cyclic Mastaglia is often characterized by heaviness, soreness and/or ‘lumpiness’ of breast tissue. If these lumps get severe enough, they can evolve into cysts & the condition is then called Fibrocystic Breast Disease. What is the theory behind ABT? Within the breast, the local adipocytes (fat tissue) are perform several functions, including acting as a major site of fatty acid metabolism, lipogenesis, and production of lipid mediators that exert influence on local tissues & providing a stored source of estrogen (which levels fluctuating along with menstral cycle). 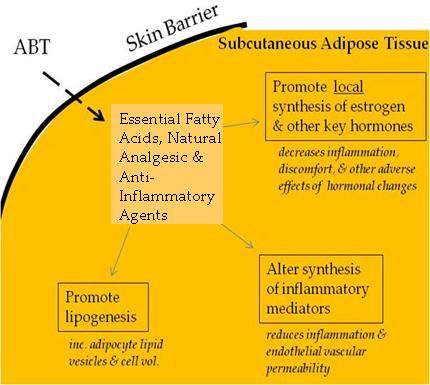 The introduction of essential fatty acids [to influence local fatty acid metabolism] into adipose tissue within the breasts should be able to generate positive effects (for example, archadonic acid metabolites are known to have a variety of hormone-like effects as well as strong involvement in the regulation of inflammatory activities). Unfortunately, dietary supplementation of EFAs has not been shown to be a particularly reliable method of changing localized concentrations of EFAs in any given target tissue due to the large number of exogenous factors. (iv) 54% of those with fibroid cysts discomfort or fibroid cyst presence along with severe menstration-related discomfort had 100% improvement, 42% had 75+% improvement, and the rest claimed a 50% improvement. The only notable side effect in the course of the study was that some participants had increased firmness and fullness of their breasts and this lead to another study on the applicability of ABT for more cosmetic purposes (for which ABT performed extremely well!). This was the major impetus behind the creation of ABT – safe, natural, easy-to-use, and most of all effective. If you’re unsatisfied with ABT, just return it for a FULL REFUND under our 90-Day Money Back Guarantee. So try ABT – and start loving the whole month!